Well, for the 4th year in a row, my family had left me home alone while they go on vacation to New Orleans for Mardi Gras. It’s become a family tradition that I’ve never even participated in because there was always some reason I couldn’t go. Usually I couldn’t get the time off work. Well, now I’m not working and couldn’t afford to go. It’s like I either didn’t have the time or the money. So this past weekend, it was just me, myself, I, and my sister’s Shih Tzu. I guess she’ll have to be my valentine this year. And, no. I didn’t rig my house with booby traps just in case a pair of greasy burglars decided to make an appearance. I had a Louisville Slugger and ADT on my side for that. Instead, I spent this past Friday evening roasting dinner for the weekend. 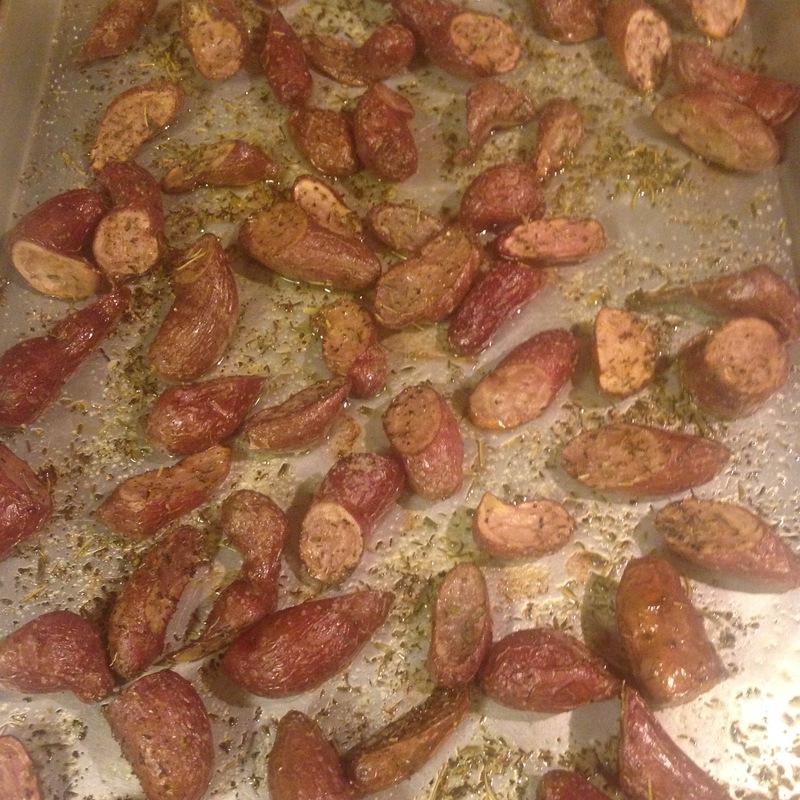 What makes me love roasting my food is that it’s one of the easiest ways to cook. And when done correctly, it’s also one of the most delicious. Not to mention the fact that it’s quite healthy. A recent post on No Bun Please called “5 Things I Learned From Ina Garten” discussed how vegetables are always delicious when roasted. So, I decided to roast my dinner, at least through the weekend, because I wanted to relax. I just spent all of last week, including the weekend before, moving and getting settled back in to my new-old home. Yes, I’m almost 27 years old and living with my parents…again. Anyway, it was a chilly weekend, I didn’t have a Valentine to speak of, and all I really wanted to do is curl up on the couch in my sweats with the pup and have a Netflix binge. What I certainly didn’t feel like doing, however, is cooking and cleaning up every single night. Confession: as much as I love to cook, I can be quite lazy with it at times. Sometimes, I just don’t want to do a whole bunch of chopping and dicing and sautéing and stirring and whatever. Sometimes I just want to throw whatever on a pan or in a pot and walk away and come back when it’s done. Which is the beauty of roasting, because it pretty much allows you to do just that. So I went to The Market to get some chicken thighs and wings, brussels sprouts, and fingerling potatoes, which I think will make a most delicious meal. And the steps are so simple. As Ina taught me through the TV, all you need is a 400-degree oven, what it is you’re roasting (in this case, the chicken and veggies), some “good” olive oil, kosher salt, freshly-ground black pepper, and whichever other seasonings you want. 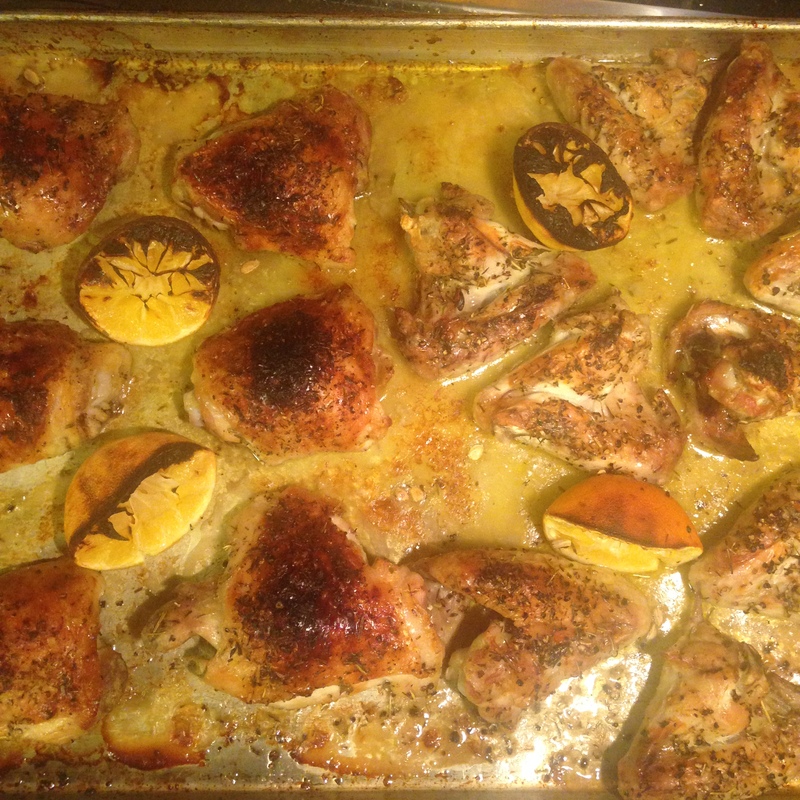 For the chicken, I used some Meyer lemon juice and Herbs of Provence. 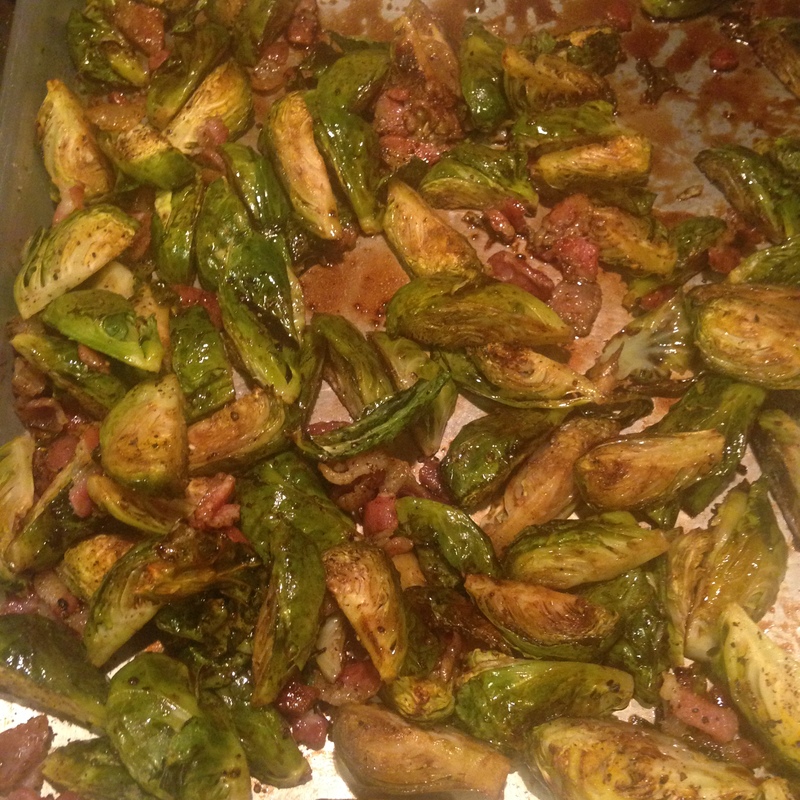 I also used the HoP on the fingerling potatoes, and then cooked the brussels sprouts with pancetta and finished them with balsamic vinegar (a’la Ina ;)). The results were delicious and lasted me all the way through Monday! What do you like to roast? How do you season it? Talk about it in the comments!